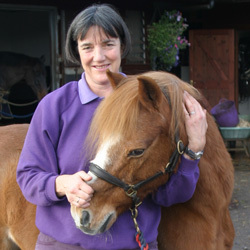 Gill specialises in the chiropractic treatment of equine and canine patients in the south eastern counties of the UK. Gill trained at the McTimoney College of Chiropractic and qualified to treat animals in 1997. She then received further practical training from Jenny Hadland, Chartered Physiotherapist (ACPAT Category A), prior to running her own chiropractic business. In addition to practising as a fully qualified McTimoney Chiropractor, Gill is an accomplished competitive rider and has competed in championship Three-Day events including Badminton, Blenheim and Windsor and up to Medium level dressage. Gill’s experience over many years competing in affiliated eventing, dressage and show jumping on a variety of horses – young and old, her own and those of other owners – has provided her with a deep appreciation and first-hand knowledge of the many types of problems encountered by owners and riders.